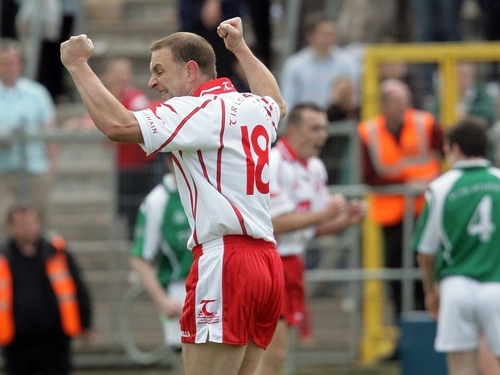 Tyrone survive to meet the winners of Donegal and Armagh but only just after an injury-time point from Ger Cavlan gave them victory over Fermanagh by the narrowest of margins. It was a brave effort from Fermanagh who had been written off by most observers after a terrible league campaign. They lost every match they played in Division 1 A and conceded 8-91 in the process. But Fermanagh made little of their spring form to push the 2005 All-Ireland champions all the way and Mickey Harte and his team were very relieved to get out of Clones with a win. The injury crisis which robbed them of nine players worsened as Colm Kavanagh had to be stretchered off late in the first half. Thankfully, the word from Tyrone is that he is not badly hurt and he was discharged from Cavan Hospital straight after the match. He left the field wearing a neck brace but that was purely precautionary. The sides were level a total of six times during the match and they could so easily have been level at the end but for a superbly-taken free from substitute Cavlan from 45 metres out. Fermanagh have had help in recent weeks from former Kerry manager Jack O'Connor, who worked with them at their pre-Championship camp last month. That work paid off in the first quarter of an hour as a goal from Mark Murphy helped them into a 1-02 to 0-02 lead. Tyrone had only two points on the board after 25 minutes when they started to hit top gear and four unanswered points put them in front at the break 0-06 to 1-02. Fermanagh did not score for the last 20 minutes of the half and the outlook for them was not great at that time. But to their credit, they battled back and had drawn level by the 16th minute of the second half. Tyrone struggled to hit top form all the way through the game but they were impressive as they opened up a three point lead with 15 minutes left. It seemed to be a decisive move but Fermanagh dug really deep and were on level terms again with seven minutes still on the watch. Tyrone went ahead again on 67 minutes before Tom Brewster slotted over a high-pressure free as the match went into added time. Fermanagh deserved to come out with a draw but they conceded a free on their own 45 metre line in the 73rd minute and Cavlan was the coolest man in the ground as he put over the winning point. It was heart-breaking for Fermanagh but it is Tyrone who will play the winners of Donegal and Armagh in the Ulster semi-final.